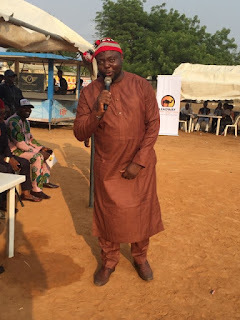 Home Featured Politics LAGOS ASSEMBLY MEMBER, Hon Dipo Olorunrinu HONOURS IGBOS IN LAGOS AT THE ‘’NDIGBO HERITAGE CARNIVAL’’ 2019. LAGOS ASSEMBLY MEMBER, Hon Dipo Olorunrinu HONOURS IGBOS IN LAGOS AT THE ‘’NDIGBO HERITAGE CARNIVAL’’ 2019. Member, Lagos State House of Assembly. A Member of the Lagos State House of Assembly representing Amuwo Odofin State constituency, Hon. Dipo Olorunrinu has said that his love for the Igbo community in Lagos, is beyond words as he is in a very cordial relationship with Ndigbo within and outside his constituency. Dipo Olorunrinu made this assertion as one of the Special Guests at the ‘’Ndigbo Heritage Carnival’’, held at the FHA filed in Festac Town, Lagos over the weekend where Igbos gathered to celebrate not only themselves, but their culture, heritage, food, costume, Language, and everything that has to do with the Igbo culture and tradition. According to him, respecting the culture of the people is one the cardinal points of human existence and as the representative of the people who are from diverse cultures, it expedient on me to respect and regard them and their ways of life, which is actually their heritage and source of existence. I respect culture and tradition, he says, which is why I am here to Honour this invitation by the organizers of this event tagged, ‘’NDIGBO HERITAGE CARNIVAL’’ and in Lagos, we welcome every culture and tradition, making her the most cosmopolitan state in Nigeria, where everyone and everybody is welcomed to live and participate in ventures that would help move the state to her destination. Speaking further, Dipo Olorunrinu says that this is the only state in Nigeria, apart from maybe Kano State, that has given people of other tribes huge sense of belonging especially in the political scene where non-indigenes of the state have at various times occupied sensitive political positions that are the exclusive preserve of the owners of the land in other states, but here in Lagos, everyone is welcomed to live and participate. As the elections into various positions of political relevance in Lagos State is approaching, Honourable Dipo Olorunrinu employed the Igbos in Lagos to use the powers embedded in the Permanent Voters Cards, PVC’s to vote for individuals who has either in the past or present represented their interests well and have provided for them, dividends accruable to them through quality representation at various levels of political relevance. He further promised to use his good office, as always, to champion the cause of all people living in Amuwo Odofin regardless of where they are from or the religion they practice, when elected for another term as Member, Lagos State House of Assembly.